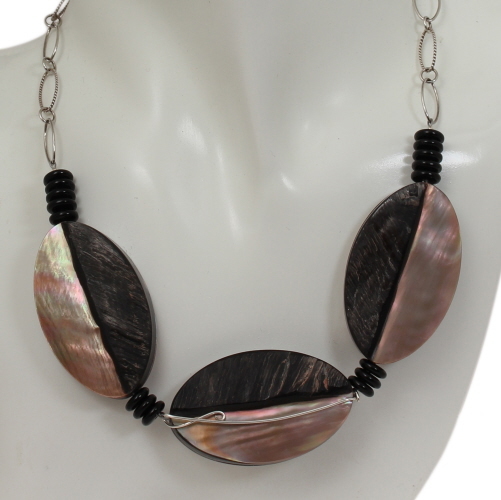 Mother of pearl is the common name for an iridescent nacre coating, a blend of minerals secreted by the oyster and deposited inside their shell. 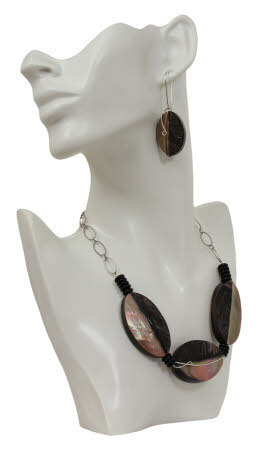 Mother of pearl and shell from the Pteria Penguin oyster, also called "the penguin wing oyster" or "brownlip shell" have been cut and assembled to create the beads used in this necklace / earring set. Orange and bright green iridescence can be seen on a golden background in the mother of pearl used here, blending well with the brown shell also used in the creation of these beads. Paired here with sterling silver chain. Necklace is adjustable in length, from 17 inches to 22 inches, and weighs 2 oz. Earrings measure 2½ inches from top of earwire to bottom of dangle and weigh just 0.25 oz each. Earwire hand formed using argentium wire.